Home for the holidays. To our family home is between Lousiana and Mississippi. My husband’s family resides in Biloxi, MS, also known as the Vegas of the South. I really do like Biloxi. It’s a small town with close knit ties. The atmosphere is very relaxing and calm. Unlike New Orleans, the views are gorgeous hillside trees and spacious expanse of skies so blue. After Hurricane Katrina, unfortunately many places closed down. The big hotels all renovated, upping the luxe and the charm. Biloxi was hit hard and many of its streets are bare. Majority like my husband’s family moved more inland towards the city of D’Iberville. Along the Sangani Blvd, a whole new community was born. Sprawling with restaurants, shops, and new homes, everything is within 1 mile. It’s amazing how this area became the epic center of live in southern Mississippi. 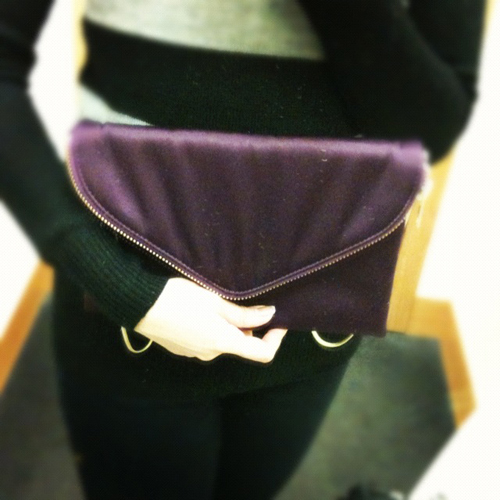 And what trip would this be without a shopping excursion to the outlet mall. 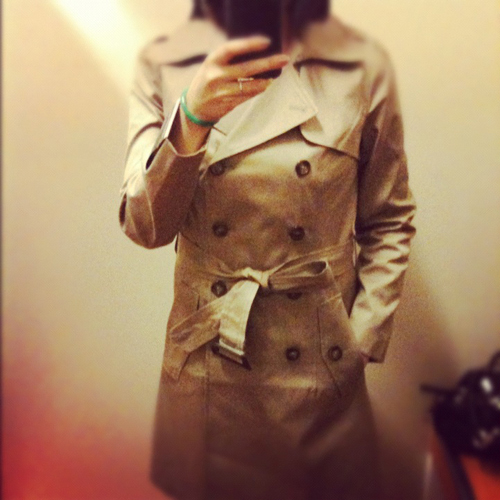 The classic trench that I tried on in Houston was black. I found the exact same one in a tan color. It was alot cheaper than Houston. Houston was $99 unfortunately with no other sale. In Biloxi, it was $99 + 40% off. I still debated whether a black would suit me better. However my husband and my sister in law thought a tan colored trench is more classic and adds a different color to my wardrobe. 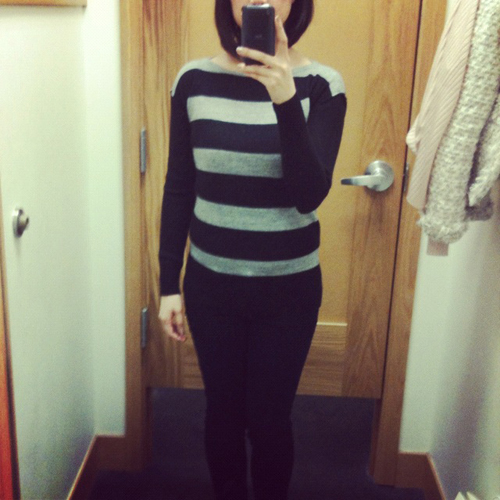 Striped sweater – I probably have many striped sweaters but the color blocked sleeves caught my eye. The shoulders are like capped sleeves but continued with a color block ribbing down the arms. It’s different than any sweater I have. After an eventful shopping day, we gorged ourselves on sushi! It has been a LOOOOOOOONNNNNNG time since I had good sushi. In Houston, you have to go towards downtown for GOOD sushi or the one in Richmond, TX which is about 20 minutes drive. However, I would be the only one making that drive since my husband and kids don’t like sushi. My husband will eat the Hibachi rice or anything terriyaki but no sushi. Good thing my SIL loves sushi! I got the Cowboy Roll (bottom) which is snow crab, steamed asparagus & cream cheese rolled inside, topped with thinly sliced seared, fresh filet mignon and red flying fish roe, served with samurai style medium spicy bbq eel sauce. My SIL got the Pink Lady which contains fresh salmon, snow crab, smelt roe, avocado, tuna and cream cheese in a roll wrapped with scarce pink soybean sheet, served with house mustard creamy sauce. What is different about Samurai is that each table gets a selection of dipping sauces from wasabi sauce, spicy mayo, bbq eel, etc. 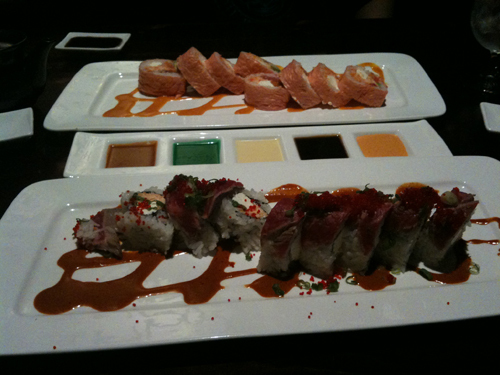 Ahhhh, craving for the Cowboy Roll as of right now.